Temporarily relieves minor aches and pains of muscles and joints associated with: simple backache, arthritis, strains, bruises, sprains. Provide concentrated, deep-penetrating heat in a self-adhesive patch that targets your pain so you have more flexibility and mobility in your muscles and joints. 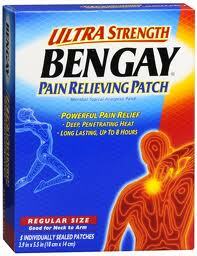 Menthol topical analgesic patch. Regular (3.9 in x 5.5 in) for lower/upper back, shoulders, hips. Long lasting, up to 8 hours. Easy to remove backing. Soft, breathable adhesive pad. Pain relieving hydrogel layer. Convenient, no mess. Open pouch and remove patch. If desired, cut patch to size. Peel off protective backing and apply sticky side to affected area. Adults and children 12 years of age and older: apply to affected area not more than 3 to 4 times daily. Children under 12 years of age: consult a doctor. Store at 20-25 degrees C (68-77 degrees F). For external use only. Do not use: On wounds or damaged skin. With a heating pad. On a child under 12 years of age with arthritis-like conditions. Ask a doctor before use if you have: Redness over the affected area. When using this product: Avoid contact with eyes or mucous membranes. Do not bandage tightly. Stop use and ask a doctor if: Condition worsens or symptoms persist for more than 7 days. Symptoms clear up and occur again within a few days. Excessive skin irritation occurs. Keep out of reach of children. If swallowed, get medical help or contact a Poison Control Center immediately.